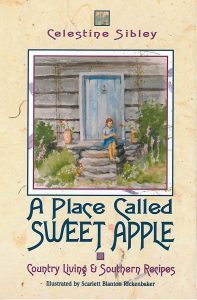 A Place Called Sweet Apple – Peachtree Publishing Company Inc.
A Place Called Sweet Apple is your personal invitation to a cozy retreat in a very special spot. Sweet Apple—the very name evokes a rural charm. That’s what Celestine Sibley discovered on her initial visit to the primitive log cabin built in 1844. And that’s what she continued to find after many years living in the house, lovingly restores and filled with the memories of her own family’s life there. “How an old abandoned house can take hold of a reasonably sane woman’s heart, fill her mind, lap up her energy and change her life is still something of a mystery to me,” Sibley muses. By the time you have savored her tale of restoring the old house, Sweet Apple’s charm will no longer be a mystery. The dilapidated ruin into which Sibley invested her heart and energy became a community project and Sibley and her family grew to love the colorful and interesting lifestyle of their neighborhood. This is far more, however, than a story about breathing new life into an old house and moving from the city to the country. It is a story of personal discovery and fulfillment laced with wry humor and good common sense. Sibley’s vision of living and loving is so clear, so pure, that no reader can put down this book without feeling enriched. The sampling of Southern recipes that she has collected here are also certain to delight. Celestine Sibley wrote her poignant and thoughtful columns for the Atlanta Journal-Constitution for more than fifty years before her death in 1999. She was also the author of more than twenty books. Scarlett Blanton Rickenbaker is widely known for her marine and landscape watercolors of her native state of Georgia. She is also recognized as a portraitist and teacher of both portrait and watercolor painting.